Hiruta, S. (1980) Morphology of the larval stages of Vargula hilgendorfii (G. W. Müller) and Euphilomedes nipponica Hiruta from Japan (Ostracoda: Myodocopinan). J. Hokkaido Univ. Edu. IIB. 30: 145-167. Horne, D. J. (2005) Homology and homoeomorphy in ostracod limbs. Hydrobiologia 538: 55-80. Müller, G. W. (1890) Neue Cypridiniden. Zoologische Jahrbuecher 5:211-252. 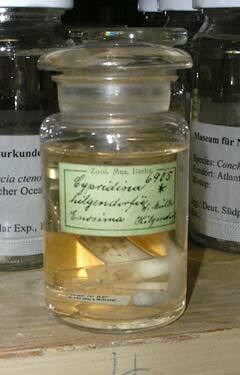 Skogsberg, T. (1920) Studies on marine ostracodes, 1"Cypridinids, halocyprids, and polycopids". Zoologiska Bidrag Uppsala (Supplement) 1:1-784.